Nominate an athlete of your choice this 2018-19 sports season to be the BURGER KING® High School Athlete of the Week. Each week, we will select an athlete to be named the BURGER KING® Athlete of the Week. Each selected athlete will have a one minute vignette highlighting their accomplishments that airs throughout the week on 97LAV & The Ticket, plus they will receive a plaque and will be highlighted at their area Burger King Restaurant. Nominate your athlete today. Below is a complete list of all the athletes that have been selected for the Burger Athlete of the Week. Please include the following: Name, High School, Sport and a brief explanation as to why you chose to nominate this athlete. Please give us your name and email address below in case we need to get a hold of your for additional information. The LAV Morning Show Broadcast is brought to you by Burger King Athlete of the Week, with the voice of LAV’s sport announcer, Travis Gibbs! Brianna Trepin is a junior at Grandville High School. She is a captain of the Varsity Lacrosse team and a 3rd year starter on the varsity team. She maintains a 4.0 GPA with a schedule full of AP classes. She just wrapped up competing on the Grandville powerlifting/olympic lifting team and earned lifter of the month. She loves working with kids and frequently helps with the youth lacrosse program. Brianna plans on pursuing pre-med after graduating and playing lacrosse in college. McKenna German is a junior at Belding High School. She is on the girls’ varsity basketball team. She is always hustling and cheering on her teammates. McKenna never fails to try to improve her skills and is always willing to put in extra time and effort. She is a kind and caring individual with a lot of basketball talent. Cameren Friend is a sophomore at Tri County High School. He plays on the varsity basketball team and has since his freshman year. He was given the All Team Confidence Player award. He has received multiple player of the games throughout the season, lifted team spirits and driven the team to wins. He helps the younger kids learn basketball in his spare time, gets good grades and is a well-mannered humble young man. He dedicated to making himself and others better and always has a good attitude. Cameren is just out to play for his love of the game. Sierra Stechebar is a senior at Sparta High School. She does track and field: high jump, pole fault and 200/400 relays. 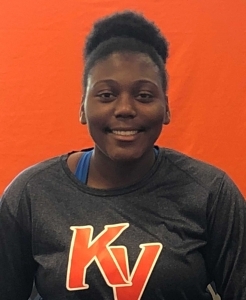 She got the award for the 2019 All State High Jump back in February at Eastern Michigan University state meet. She has signed and Athletic and Academic Scholarship with Concordia College Ann Arbor for Track and Field and will start at Concordia in the Fall of 2019. She also has a 3.4 GPA. She is a hardworking athlete that pushes herself on the field and in the classroom. 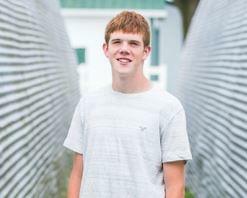 Crue Cooper is a junior at Fruitport High School. He is a starter on the Varisty Wrestling Team. He qualified for the State Championship by placing 2nd at regionals. He lost by 2 points to the returing State Champion. He has a record of 41-2. He is not only a wrestler but a football player and even better young man. He is humble and is devoted to setting a good example for the other kids. 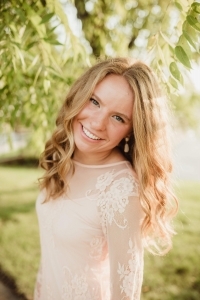 Kennedy Helderop is a senior at Hopkins High School with an outstanding basketball IQ. Her attitude on and off the court affects the team greatly in many positive ways. She has played basketball since she was aout 8 years old and has continued to grow and lead teams throughout her 10 years of basketball. She wants to attend a four year college and major in math. Rayana Sahagun is a wrestler at Sparta High School. She recently won the MHSAA Women’s Wrestling Tournament in the 103lb weight class. Rayana has won over 70 matches on the Sparta High School boys wrestling team. She puts her time in at the gym, in her schoolwork and in the community. Rayana recently lost her uncle, who was her biggest supporter, but she persevered. She won the finals by a pin in the third period. Rayana is ranked in the top 10 nationally in women’s wrestling. Dylan Hulliberger is a wrestler at Belding High School. He is a two time District Champion and going to Regionals. He continues to improve himself and his team as he pushes to be the best and helps others to be their best. Dylan helps as a senior captain and helps make sure his teammates work hard in the classroom and on the mat. Dylan is in the National Honor Society and plans to become a Physician Assistant at Central Michigan University starting next fall. 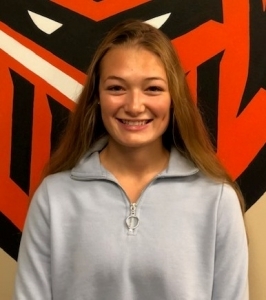 Julia FInley is a freshman at Belding High School. She joined the freshman cross country team part way into the season. Coach Carlson has been asking her to run since middle school. From the moment she began competing in the varsity level, she placed high. She proved her personal record in almost every single race. In the recent conference finals, she finished 4th and just 10 seconds behind 1st place. Her efforts this season have earned her the honor of first team all conference as a freshman. This is her first time competing at this level as well. She is a straight A student, on a traveling soccer team, in the marching band and on student council. Lucas Townsend plays varsity water polo for the portage central and portage northern high school combined team the Muskies. The Muskies are off to a great start this season and the new Portage Central pool. Lucas is a goalie and has only been playing throughout high school and has amazing success. Not only is he a varsity athlete but he is also a IB diploma candidate taking extremely vigorous high school class and still balancing it with his success in the sport at the same time. He loves the sport with his whole heart and wants to share the amazing sport of water polo in a community where it is very unknown. 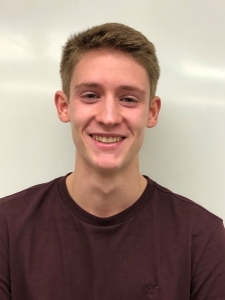 Isaiah Guenther is a senior at Thornapple Kellogg High School. He’s been on the basketball team for 4 years as a varsity player, 3 years as a starter, and was first team OK Gold as a Junior. Isaiah has also been a 4-year varsity player on the tennis team. Aside from sports, Isaiah has also been in the honors choir, on the Youth Advisory council, the Business Professionals of America, the National Honor Society, the Student Council, Odyssey of the Mind, the Robotics club, and several musicals and plays while attending TKHS. Isaiah has a 4.3 GPA, and has been accepted in the College of Engineering at Cornelle University, an Ivy League. Congratulations, Isaiah, on being our Burger King Athlete of the Week! Cory Ainsworth is in his senior year at Wayland and besides a great basketball player he is a even better student. In the battle of 1-96 at Ottawa Hills he scored 29 points. And has a Grade point Average of 4.152. He has scored 20 points plus for the first 3 games. Lauren Freeland is a senior at Kent City High School. Lauren earned all-state honors for the 4th time in cross country this year with her 3rd place finish in the Division 3 State Championship meet, plus helping guide team the team to 7th place. During her senior year, she set a new school record in the 5K which adds to her 4 track & field records. She added another academic all-state honor to her resume too. She has a 4.0 GPA and is a member of the National Honor Society. At the conclusion of the state cross country season, Lauren qualified for and represented Team Michigan in the Mid-East Meet of Champions in Ohio. There the seniors from Michigan won the 4-state all-star invitational. Lauren also excels in track & field where she was all-state in the long jump and 800- and 1600-meter runs last year. She is a starter on the state ranked Eagle basketball team too. 2018 Michigan Apple Queen first runner-up. 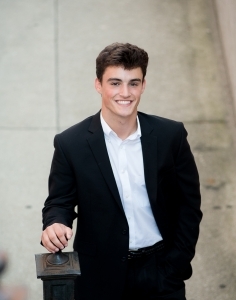 Corey Gorgas is a Senior at Saugatuck High School with 3.782 GPA. Corey is the captain of the Cross Country team. He was the Division 4 State Champion individually and also lead Saugatuck to their 4th team State Title in the last 6 years. Corey qualified for the Nike Cross Country Nationals by placing 3rd at the Nike Midwest Regional meet in Terre Haute Indian on November 11th. The Nike Cross Country Nationals will be held this weekend, December 1st at Glendoveer Golf Course in Portland Oregon. Corey has yet to make his college decision but has narrowed his choices to Norther Arizona, Michigan State University and The Univesity of Michigan. Corey is a leader in class room and on the athletic field. He is a member of the National Honor Society. Corey holds school records in the 5k, 3200m run and 1600 meter run. Last Spring he was State Champion in the 1600 and 3200 meter runs and lead Saugatuck to a 4th place finish at the Division 3 State Finals. He is a 8 time all-state athlete. 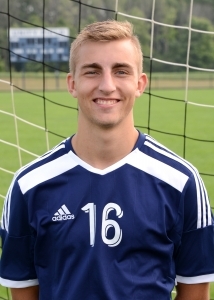 Chase Rozeveld is a senior at Hudsonville Unity Christian. 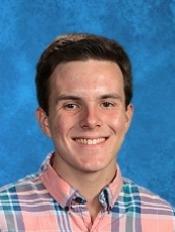 Chase had an excellent season for the Crusaders varsity soccer team scoring 14 goals and 5 assist on the season, which was topped off with the team winning the Division 3 soccer state championship in overtime against the number one team in the state. During the run to the state championship Chase was selected to the All-District team. In the spring Chase runs on Crusaders track team in 110 and 300 meter hurdles. He is an excellent student as well with a 3.79 grade point average and is a member of the advanced choral ensemble and musical cast for the school. Chase has gone on three mission trips with his church. 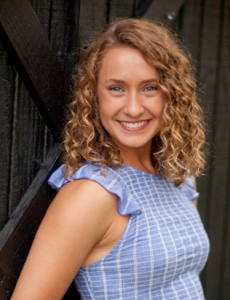 Elise Jendriz, is a senior at Rockford High School and is a member of the Rockford Swimming & Diving team. Elise was undefeated this year, plus broke Rockford’s diving record that had been held for previous 18 years. She then bested her own 6 dive record during her senior year. Most recently, Elise shattered her 11 dive record at the conference meet by 21 points. She is a two time All American diver. Elise works extremely hard both in the pool, and in the classroom. A result of her dedication to her studies, Elise has a 4.3 GPA, receiving academic honors in her first three years of high school. She was in part of the Spanish immersion program and travelled abroad to Spain. Adit Dau of City High School. 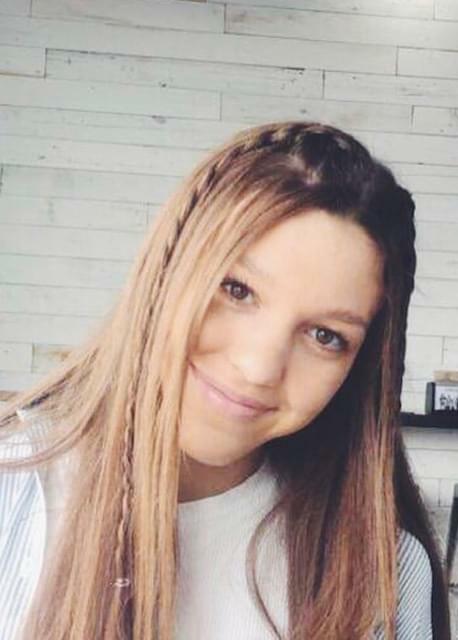 Adit is a freshman a City High, but runs for the Ottawa Hills girls cross country team, which she has made a huge impact in her first year on the team. She has been the medalist in every race this season up until the Division 1 regionals at Allendale where she placed second with a PR and school record time of 18:01, qualifying her for the state championships at MIS Speedway. Adit helped lead her team to an OK White conference championship, plus for the first time ever the Bengals girls cross country team are going to the state championships. 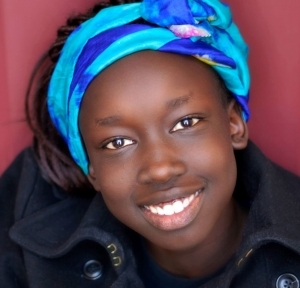 Adit excels in the classroom as well, which can be challenging since English is not her first language, being that she and her family are refugees from Sudan. She came to the US in the first grade. Adit also volunteers with the elementary cross country meets. Jason is a senior at NorthPointe Christian . Jason is the goal keeper for the Mustang’s varsity soccer team. He has been outstanding for his team in goal with a 92% save percentage guiding his team to an 18-4-1 record and a district championship. He has received all-conference and all-district team honors. Jason also is a standout baseball player earning all-conference, all-district and all-regional team honors as a junior last year. Jason excels in the classroom as well with a 3.79 grade point average. Outside of school Jason volunteer at the Spectrum Health Neurological Rehab Center, playing games with patients that have suffered traumatic brain injuries. Brady Swinehart, a senior at Ionia High School. Brady is a three sport athlete participating in football, basketball and golf. As a junior, last year, he earned honorable mention in football. In basketball he was named the team’s MVP his sophomore and junior year, plus he’s earned all-conference honors those two years and was co-county player of the year last year. He was named to the Lansing State Journal Class B All Area Team. 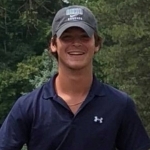 Brady excels in the classroom as well with a current GPA of 4.056 and he is involved in National Honor Society, Youth Advisory Council, Interact, Link Crew, Ionia Athletic Advisory Council, and the Principal Advisory Council. Zoe Anderson of Belding High School. She is a senior on the girl’s golf team. On the season, she has been a medalist in every match, with a scoring average in the low 40s. She has received OK White All Conference honors 4 consecutive years and last year was selected to the Division 3 all-state team. She also plays basketball. Zoe is an excellent student in the classroom as well with a 3.57 grade point average, which she is a member of the National Honor Society. She volunteers regularly throughout our school and community, including as a peer tutor. Zoe hopes to play golf in college and pursue getting her PGA card. Lucas is a junior at Lowell High School. He’s been a three year varsity member of the Lowell’s Cross Country team. This past Saturday, Lucas had a personal best times of 16:44 at the Allendale Falcon Invitation. He’s had 5 Top 10 finishes out of the 8 races this season. Lucas also serves his team as a captain and leads by example on a daily basis. 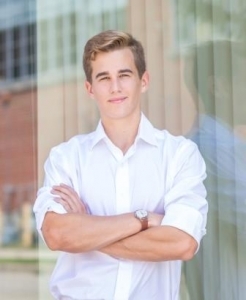 Off of the field Lucas is involved with the Lowell’s fusion rock orchestra, on student council, interact club, Flat River Outreach Ministry and does this while maintaining a 3.8 GPA. In the spring Lucas is on the track running in the 1600 meter and 3200 meter races. Indonesia Carpenter is senior at Kelloggsville High School. Indonesia is having a great season as a middle blocker for Kelloggsville varsity volleyball team. She is a great leader on and off the court for the team. She’s been a starter on the varsity basketball team since her freshman year, plus been part of the Kelloggsville marching band for 4 years. She currently has a 3.4 grade point average and is part of the national honor society. She volunteers outside of school at Michigan Blood, her church and her grandmother’s senior citizen home. Indonesia is planning on attending Central Michigan Student after high school. Eason is a quarterback on the varsity football team and plays baseball in the spring. After a tough loss in the opening game of the 2018 season, Eason has guided to a 3-1 record with wins over Zeeland West, Wyoming and West Catholic. Eason has completed over 70% of his passes for 774 yards and 8 touchdowns on the season. Eason not only excels on the football field, but also in the classroom with over a 3.0 grade point average.